The New South Wales Waratahs will continue to live and die by the sword as coach Michael Cheika encourages his charges to try to win an elusive Super Rugby crown in style. In one of the most invigorating games of the season, the Waratahs' thrilling 39-30 bonus-point triumph over the Hurricanes showcased the best and the worst of Cheika's Jekyll-and-Hyde side. Five tries in a free-spirited attacking display ultimately compensated for a series of botched re-starts, wild lineout throws, shoddy scrums and brittle defence in a crucial comeback from 17 points down at Allianz Stadium. The victory preserved the Waratahs' unbeaten home record in 2014 and propelled them to within one point of Australian conference leaders the Brumbies and to fourth place overall. 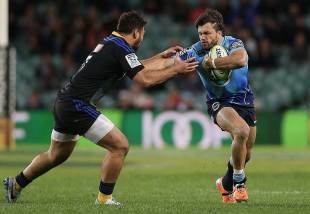 The dazzling win also came a week after a misfiring loss to the Blues and Cheika said Waratahs fans should buckle up and enjoy the ride: his team's running rugby is here to stay. "We'll never change. Regardless if we make the finals or not, this is the way we play the game. We've just got to do it," Cheika said. "If the trend is against attacking rugby, we've made a conscious decision - as I think the Hurricanes have as well - to play against the trend and just try and get so good at it so that we can be competitive against the penalties and the kicking style of game that tries to trap you. "It would be difficult for us to play any other way. We don't have any really long-range kickers. So (striking a) balance, yes. But there's no way we're going to deviate from what our identity tells us how we want to play the game." Cheika suspects the Waratahs' daring ball-in-hand style is what the fans want too. "I know that winning's everything but there's 16, 17 thousand people that come out here every week to support us that want us to play like that and that's how we're going to play," he said. "When you play how we want to play, sometimes that's what you get - where you attack a lot and errors come in, it's just the nature of that style. There's a lot of pressure in these games every week and you're not going to do it perfectly every time." The Waratahs beat the Hurricanes at their own game in an end-to-end, eight-try spectacle and Cheika would love to finish the season playing the Wellington outfit for the title. "I personally really appreciate the way they play the game as well," he said. "That's the way the game should be played and we're trying to be part of that movement. I hope that's a team we might see somewhere further down the track again because they're a really good attacking unit and they enjoy playing the game. That's what we try to aspire to as well."